This was one of those Così rectifying the internalised misogyny of the play. Some impressive singing from the cast tonight #ROHcosi still don't like this production much. Tries to be a bit to clever. Beautiful singing from #SalomeJicia in #ROHcosi in somewhat disjointed production with odd mixture of costume design. 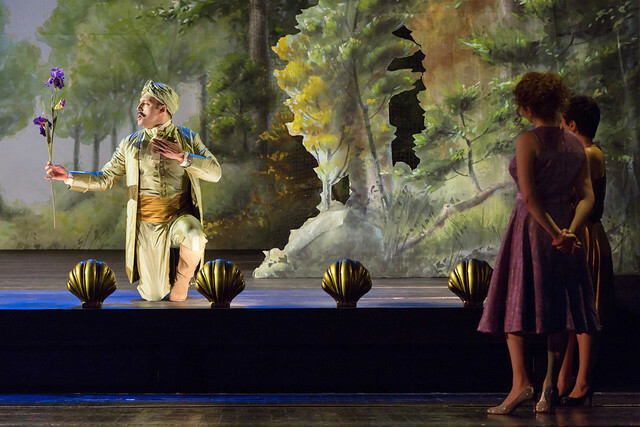 What did you think of Così fan tutte? 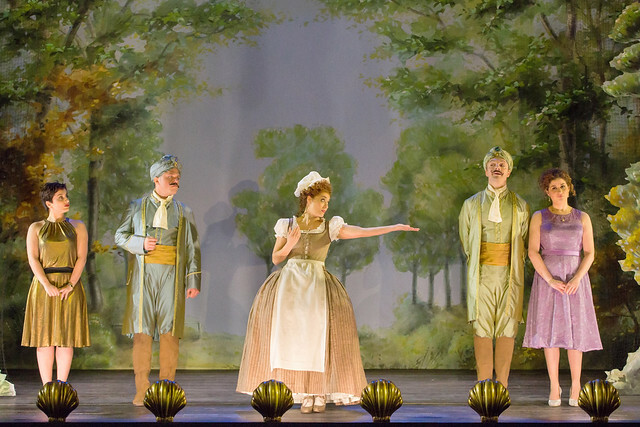 Così fan tutte runs until 16 March 2019. Tickets are still available. Wonderful music and singing and very entertaining - production ok but at times somewhat random and distracting from the music. This was not the best production of Cosi I have seen. Perhaps it was not to my not to my taste but I think that I was not alone. An underwhelming production. Music and singing very good, but the tempi choices were strange: some too fast to allow the singers any articulation; and some so slow as to almost lose the line. It was also a very static production and could easily have been a concert version. That said, the playing and singing were generally excellent and it is difficult not to enjoy Cosi, whatever is happening on stage. Frankly I'm baffled by all the en passant praise for the singing, much of which struck me as weak and approximate, especially that of the men. The staging is rather better than its poorly-delineated "konzept" - the women are in on it from the outset - actually merits, though the closing scene inevitably then makes no dramatic sense whatsoever; and deplorably, such tinkering entails far too many liberties being taken with the surtitles, a reprehensible mixture of fudge, rewriting and outright omission. And though Montanari's conducting is certainly a considerable advance on Semyon Bychkov's grotesque trudge-fest last time round, the former's fortepiano accompaniments to the secco recits this time are beyond horror, unidiomatic, harmonically confusing for the singers, overly loud and amazingly ill-timed. Saw this first time around and liked the ideas of the production but boy a long evening, or so it felt with tempi then . Sat in stalls across from Montinari and loved his "performance". He nudged the orchestra out of their comfort zone which is a good thing and attempted to get a period sound/style in the strings..which i am not sure they were sure about. His playing in the recitative will divide but i want to hear a performance like this which makes me realise how good the music is and go back to it..and this did it for me. Was so looking forward to this tonight (Monday March 4). But it was a fiasco. Power cut backstage half an hour into act one. Lengthy delay, followed by an "early interval" . The opera was then performed more or less as a recital. No surtitles, none of what look like lovely sets in the photos above because the scene shifting mechanisms had broken down. Due to the lengthy delay we had to leave before the end for last train back to Kent -as did about 20 per cent of the audience by the look of it. Someone said the performance was dedicated to Bernard Haitink as it was his 90h birthday. What an insult to the great man. Worst night I've ever had at Covent Garden. World class singers, world class conductor, world class orchestra - all let down by the House's dodgy third world electrics. Hang your heads in shame, ROH. I see there are thre more performances in the run. Will you be offering complimentary tickets to those who were so badly let down tonight? I travelled from the USA for the March 2 Don Quixote, fantastic! !, and the March 5 production of Cosi` and expected to see the lovely sets I had seen in the ROH previews. The power outage was unfortunate and all present where understanding, good-humored and appreciative about the improvisations that had to be done. However, the ROH was careless about their audience and should have offered each guest a small gift of appreciation, a glass of wine, a discount on a future visit, something! But no, it remained aloof about the problem and thus lost my admiration. Thus production just didn’t work at all for me . The odd combination of costumes , the ladies with their coats constantly on and off . It seemed to me it was justo trying just too hard and although the singing was lovely I couldn’t watch it as I found it all very annoying . Lovely event last evening in trying circumstances. Singing was beautiful. Well I think a lot of issues were solved by the power cut on last nights performance ! After about an hour delay we got a whistle stop tour through the best bits - with pages of "how daft are these women" recitative being cut ! All done on the first (and nicest) set and finished more or less on time. Lovely singing by T Allen and the youngsters, but the production and the power cut were straight from the end of the pier show. How much did we pay for the ROH renovations? And do we still have a safety curtain? No sign of it last night despite a serious power malfunction which we heard as well as saw. Well done players, you deserve danger money! Beautiful singing and playing last night under difficult circumstances. Can't really comment on the production except I can't imagine why anyone would deliberately include some ridiculous action when the Overture was being played. Sadly I thought the conductor was thinking the opera was all about him with unhelpfully large helicopter arm movements and playing the harpsichord like a concerto. Less is more, but the orchestra were amazing despite his best efforts!!!!! Lovely voices. Clumsy, over-thought production. A meta-opera? Give me a break. Mozart, and we, deserve better. I enjoyed the singing, the orchestral playing and the wonderful fortepiano continuo. A truly lovely musical performance. I very much disliked the production and will actively avoid seeing anything directed by Mr Gloger ever again.It takes a very perverse talent to wreck a masterpiece lik Cosi. I found the first half a bit boring. I wanted the singers to really sing more of the emotions they were feeling and have more heart in it. I felt the tenor had a light voice and sometimes needed more to it, and I found the two sisters lacking in any real character which came across in the singing. I enjoyed the second half a lot more than the first and I didn’t mind the production. I’ve been to The Met a lot recently with pretty traditional producitions so this felt nice. I didn’t come away feeling wow really though in any way, disappointed more than anything to think that this is the best a top Opera House can find with regards to singers. Beautiful singing, cool design, it should have been a treat. But we had the misfortune to sit directly behind the conductor. I could take his tuneless humming along. I couldn't take his constant snorting and grunting like some kind of rutting hog and the ceaseless flailing of his arms. Self indulgent nonsense. Apparantly his ROH debut. Surely also his finale. Great music - an almost perfect opera. Reasonable singing, given the hurdles the singers had to overcome due to the stage direction and the idiosyncrasies in the pit. Much of the real humour of this wonderful opera buffa was lost, due to the propensity to look for cheap laughs in the production. The recitatives were a complete shambles due to the horrendous, unmusical and egotistical antics at the keyboard. Musical performances in opera often highlight the negative shallow overthinking of contemporary operatic direction - here, both were as bad. Did I mention the sometimes ridiculous speeds? Despite all the drawbacks, great music shines through, as always! I enjoyed the evening, great singing AND acting. The orchestra and conducting were exciting and pleasing BUT the fortepiano was abominable - loud and who composed some of its ramblings? The biggest bugbear was the dreadful staging, too many ideas, mostly irrelevant to the plot and horrible stage tableaux. This did not clarify or unify the story. Where is simplicity? Mostly in underlit dimness. The extras were superfluous. Bravo to the singers for coping so well with all this nonsense. Mozart/da Ponte must be virtually indestructible because it's still a 4 star show! But why put on these "a la mode" fashionable costly? productions? Even a few props on a bare stage would be better - not my first choice but you get the idea. I've seen Cosi more times than any other opera and this was revelatory, This was a world away from twiddly-twiddly continuo and Semyon Bychkov last time. It was nothing short of dazzling to see Stefano Montanari recreate completely naturally the spirit of Mozart (from "Amadeus") from his fortepiano. From the stalls circle overlooking the orchestra, it was like watching a sort of hippy version of Mozart (I'm not denigrating, I'm admiring) conduct with boundless restless energy and invention and love for the music. Montanari gave us in your face continuo. It sounded improvised but I think wasn't - he kept his eyes on his score while playing it. It also frequently sounded harsh and dared to sound a bit ugly and apparently contradict the wonderful orchestral score which he shaped beautifully, always asking his players to play more quietly. I was convinced. You don't need to be trussed up to play great opera superbly. Montanari wore a t-shirt of varying greys. This was necessary as he frequently stuck his baton down his back when he needed both hands on the fortepiano (he couldn't have done that in a stiff collar), and at least once put it between his teeth. I know I've not mentioned the usual things opera-goers talk about but I do so to try to bring out how an alternative approach to live performance can still today make you rethink an opera which is over 200 years old and which you've seen many times before. Montanari gave a new atmosphere and feel to the opera for me. It was surprising, so alive, so different from any other performance of Cosi I've seen. You don't need a formal appearance of perfection to be perfect. It's good to have your expectations and prejudices shaken up a bit. No, I didn't spend the whole opera watching the conductor, but that's long enough. I did not like this production at all the first time around, a few years ago. It did not improve on a second viewing. Too many changes of time and place, messy and overthought. The 5 young singers were excellent, with power combined with acting ability. Malfi fantastic as Dorabella. Jicia has a lovely voice and I look forward to hearing her again - perhaps not the perfect voice for Fiordiligi but great range. Thomas Allen's performance will make a sad memory for me: I have seen him sing this role many times but he has lost his voice and power. The loss of the contrast in the arias where he has a major role was noticeable. He needs to stop, now. I agree with Mr Pennington that the choice of very slow tempi in many of the arias was painful,and I also found the loud fortepiano annoying. Like others, I will not be rushing to another performance conducted by Monanari or directed by Mr Gloger. Pity for those coming new to this wonderful opera, who may be put off. I loved the ensemble work and particularly liked the allusion to the garden of Eden - totally changed to title's meaning from an insult to women to commentary on the fallen state of us all. This opera is becoming my favourite Mozart, and that is saying something! 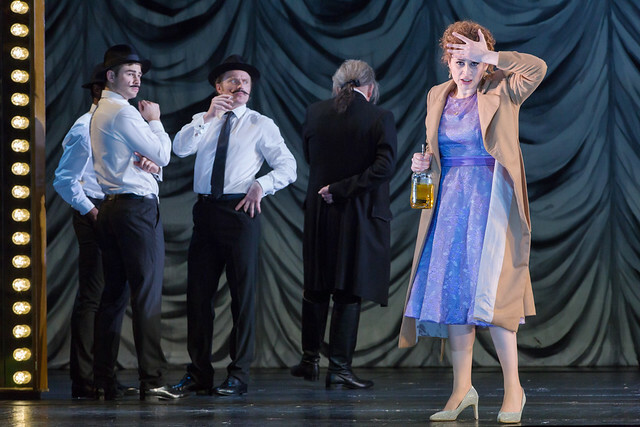 Your Reaction: What did you think of Verdi's La traviata live in cinemas 2019? The Royal Opera's classic production was relayed live to more than 1,000 cinemas in 23 countries.